A Chemical Peel removes the top layers of the skin, allowing newer, smoother skin to grow. A smooth complexion is the signature of youth, but let’s face it, life happens, all over your face. 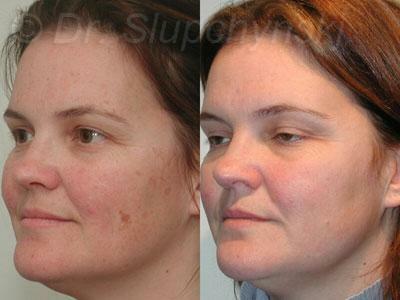 Heredity, lifestyle, and environment cause unsightly blemishes, unwanted creases, and worse, dangerously unhealthy skin. As a matter of fact, most marks of aging result from exposure to the elements, not age. Whether you’ve worshiped the sun all your youth or simply have a case of bad genes, skin resurfacing through a Chemical Peel restores skin to a smooth, healthy, and youthful appearance. Skin Resurfacing through TCA Chemical Peels or Phenol Peels, are often performed in conjunction with a Facelift, and are highly effective in the treatment of fine lines and wrinkles, hyper-pigmentation, pre-cancerous lesions. Dr. Slupchynskyj preferred method of Skin Resurfacing is with the “Obagi Blue Peel”, a superior Chemical Peel that delivers the best possible results in skin resurfacing today. What is Skin Resurfacing with the Obagi Blue Peel? Unlike common Alpha-Hydroxy Peels or at-home procedures, the Obagi Blue Chemical Peel puts control of your treatment in professional hands. 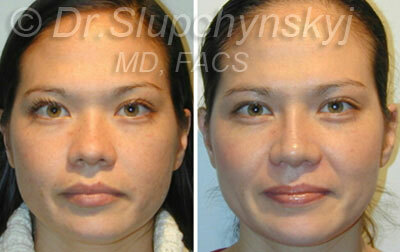 Based on your individual needs and skin condition, Dr. Slupchynskyj determines the strength of the Chemical Peel. The Obagi Blue Peel uses Trichloracetic Acid (TCA) as the active ingredient mixed with the patented Blue Base from Obagi. Dr. Slupchynskyj will apply the proper strength of the Chemical Peel based on your age, level of sun and environmental damage and your desired level of transformation. What are the Benefits of the Obagi Blue Chemical Peel? 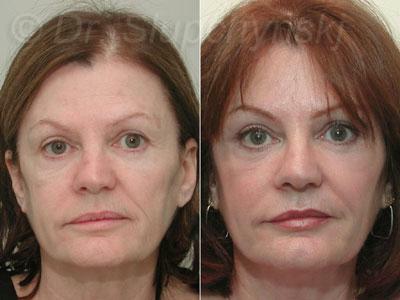 The Obagi Blue Peel Healing time is much quicker as compared to Dermabrasion or C02 lasers. The Obagi Blue Peel can be and is commonly performed in conjunction with surgical procedures such as Blepharoplasty, Facelift, SLUPlift™ MiniLift, Mid Facelift and Mini Facelift in Manhattan. Skin Resurfacing with the Obagi Blue Peel is effective and safe. Is the Obagi Blue Peel Right for Me? The Obagi Blue Chemical Peel is an excellent option for anyone who wants to look better and reverse the appearance of the aging process. Those who have blemish-prone skin, wrinkles, pigmentation problems, sun damage, or general poor skin quality will benefit the most from this Chemical Peel. During your consultation, Dr. Slupchynskyj will closely examine your skin and thoroughly describe what you can expect from a Chemical Peel. Dr. Slupchynskyj will advise you on how many Chemical Peels are needed to give you your desired result, which will be based mainly on your age and the amount of environmental damage inflicted on your skin. What can I Expect during and Immediately Following My Chemical Peel Treatment? A Chemical Peel treatment with the Obagi Blue Peel takes less than an hour in our office; a light sedation may be utilized to minimize discomfort. The Blue Peel is typically applied to your face and neck. A mild burning sensation will occur that generally lasts only a few minutes. You may then experience a bluish tint to your skin that usually washes off in 12 to 24 hours. Are there any Risks with the Obagi Blue Peel? What is My Recovery Time? Depending on the strength and depth following the procedure, you will experience slight swelling. Within 2 to 3 days, your skin will begin to peel. This peeling continues over the next several days. By the 7th to 10th day, your skin should be healed. Once your skin has completely recovered from the Chemical Peel, and is finished peeling, you will notice a visible improvement in your complexion. Your skin’s appearance should continue to improve for the next 4 to 6 weeks, becoming firmer, clearer, smoother, healthier, and more youthful looking. A well-tolerated procedure, a Chemical Peel rarely produces erythema or inflammation. Patients can thus resume their normal lives more quickly after Blue Peel than after CO2 Laser procedures or Dermabrasion. Chemical Peel healing is relatively painless and occurs within 7 to 10 days. How Long do the Results of a Chemical Peel with the Obagi Blue Peel Last? A Chemical Peel treatment with the Obagi Blue Peel generally lasts for years if you are willing to take the steps to protect your new healthy skin. Dr. Slupchynskyj will advise you to be diligent about maintaining the new health and look of your skin with daily use of sunscreen and/or maintenance with the six step Obagi Skin Care line. results by removing fine wrinkles and improving skin texture. 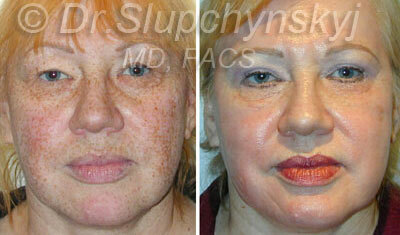 Contact our office today to find out why people choose Dr. Slupchynskyj and the Chemical Peel!